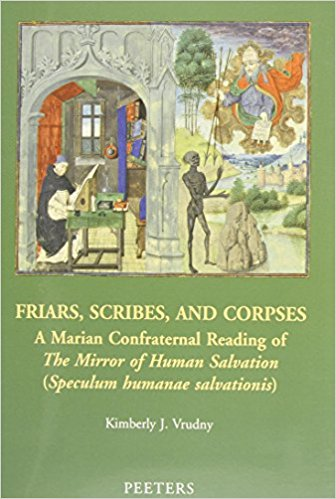 Friars, Scribes, and Corpses: A Marian Confraternal Reading of The Mirror of Human Salvation (Speculum humanae salvationis) (Mediaevalia Groningana New Series) by K.J. Vrudny (Author) The Speculum humanae salvationis (Mirror of Human Salvation), a medieval book recounting in forty-five chapters the story of human redemption within the larger context of the Virgin Mary's life, was something of a "bestseller" in the Middle Ages, surviving in over 400 copies. Because the author wrote anonymously, however, little about the book's initial context is known despite a century's-long effort to uncover the author's identity. Friars, Scribes, and Corpses investigates a Marian confraternal setting for the Speculum's emergence, and newly proposes consideration of Nicola da Milano as the poem's author. Its central chapters show how the scribes who copied the Speculum preserved the author's rhetorical considerations that served so well the purposes of Marian confraternal preaching, including elements that suit memory training techniques used in the Middle Ages, such as building an architectural structure in one's mind, tagging memories with emotion, and internalizing the transformative nature of spiritual lessons. The final chapter asserts that the poem's lessons would have been particularly desired in the context of plague, when the number of corpses threatened to destroy people's faith in a merciful God. Friars, Scribes, and Corpses challenges assumptions about the Speculum, as well as the dominantly held view that there was an overwhelming emphasis on death in the late medieval period. Rather, this book demonstrates that there was a competing emphasis on life as glimpsed in the glass of the Speculum.